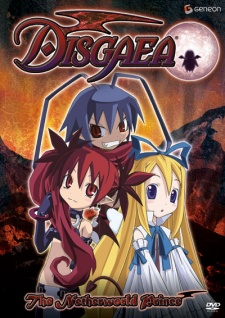 Watch Disgaea full episodes online English dub. Synopsis: An angel arrives in Hell! A demon lord is awakened! There are penguins everywhere! What’s going on here? Based on the events of the game Disgaea: Hour of Darkness, Makai Senki Disgaea follows Laharl’s journey to squash the demon rebellion, reclaim the throne, and destroy anyone who stands in his path. Or, you know, let them join him on his travels if they really want. Just remember: Laharl is a demon lord. There’s no way he’ll ever show kindness, compassion, or love… right?